As everyone knows, there was a time when the world's population used tools and weapons that were made from stone and wood. Then came two phases in which material culture started to change. These two phases are know as the Bronze Age and the Iron Age. The Bronze Age started around 3,000m B.c. and was an important phase in the development of new material culture because it introduced a new metal bronze in the making of tools and weapons. The Iron Age changed material culture after the Bronze Age due to the start of smelting iron, a complicated process, and the process of iron smelting provided even better and stronger tools and weapons than the previous phase. This exhibit will expand on the creation of bronze and the process of iron smelting. It will also show how and why archaeologists study Bronze and Iron Age tools when researching different archaeological sites around the world. The Bronze and Iron Ages were important material development phases that changed the ways the world developed and manufactured tools. "Iron Dagger.-IRON AGE Anonymous, c. 4500 BCE- c. 600 CE; photo credit: Kathleen Cohen/California State University, CA." World Art. Accessed December 11, 2012. http://worldart.sjsu.edu/VieO114647?sid=8748&x=1413211. The Bronze Age consisted of metalworkers casting bronze tools and weapons using an alloy called copper. Copper was mixed with another metal, tin, to create the metal that we know as bronze, which was stronger than the other two metals individually. Discovery of a stock of pure tin and the absence of any artefacts made of tin at Machu Picchu suggest that the Inca Artisans used the tin along with a stock of copper to formulate their bronze (Gordon, 2006). Many tools were made in the Bronze Age to help the population of societies farm, hunt, and even do household chores. Most societies had different tin percentages in the bronze that they created. The metalworkers at Machu Picchu chose bronze containing four to seven percent tin for their tupus, tumi, and artisan's tools (Gordon, 2006). Of course, many societies differed in their creation of bronze because some bronze tools were created for different purposes such as fighting, farming, or to show social status. Relatively high-tin percentages in the bronze tools or weapons usually showed this social status. Cultural tendencies such as the use of bronze to emphasize a certain value or status should be regarded as a possible factor, that contributed to the massive use of tin in the second millennium B.C. (Morr, 2011). Casting bronze from copper and tin created new material culture in the phase called the Bronze Age. The iron Age brought about the casting of iron or iron-smelting, which was a much more complicated process than creating and casting bronze. Not only was it a complicated process, but very few metalworkers actually knew the process of how to cast iron properly due to all the factors that played a role in the process. The factors in the process were oxides of iron, amount of carbon dioxide, and temperature. If Iron oxide if heated to a rather low temperature in the presence of an excess carbon (if more than a limited amount of carbon dioxide is present, wither the production will not take place or the will go back to oxide), the oxide is reduced to metal (Read, 1934). Temperature also plays an important role since when the iron is held at a high heat for a certain amount of time with carbon present, then the iron will absorb the carbon . When the carbon content is 86 pounds to a ton of iron the metal is the hard, brittle substance known as cast iron (Read, 1934). Iron casting was a long complicated process that in the end made it very expensive compared to bronze. Good quality iron was expensive, probably much more expensive than bronze, which is much easier for a worker to handle who does not understand the "why" of the operation (Read, 1934). The iron age was named for the development of cast iron and the process of making cast iron was much harder than the development of bronze. From a excavation at Byblos, weapons were analyzed to investigate the different technological aspects copper based alloy metallurgy. 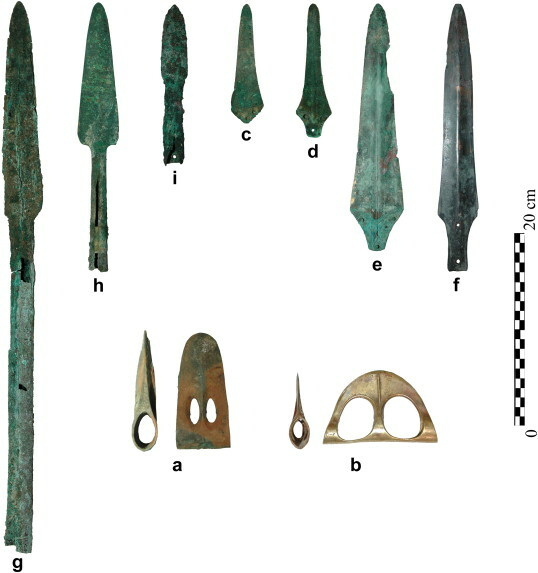 Ninety-four samples were collected by cutting small pieces of metal with a saw and they represent different parts of the weapons (Morr, 2011). The researcher used reflected light microscopy to view the crystalline structures to observe the different presence of alloys within the bronze weapons. Measurements of each sample of weapon were also taken. The size of the measurement area and the number of global analyses performed on each sample depend on the shape and dimensions of the observed sample surface as well as the corrosion infiltration inside the sample (Morr, 2011). The evidence from the analyses showed what percentage of alloys each piece of weaponry consisted of. Also, the analyses showed that some of the weapons were made with moulds to help get the weapons the shape that they needed for use. The data showed that the Byblos craftsmen possessed a thorough knowledge of copper base alloy metallurgy which could be manifested by operations such as cold working brittle copper base alloy and accurately designing and making moulds that would reduce casting defects (Morr, 2011). The different types of alloys within the bronze showed that this certain region used different alloy recipes in the making of bronze age weapons. The excavation of a site at Titris Hoyuk presented many conclusions about the ways in which a society manufactures and distributes tools and weaponry. A blade workshop was discovered at the site of Titris Hoyuk by excavating residential houses and different mounds within the area. One mound contained many blade cores, along with lithic materials, and flint waste. Also, large pits were discovered that contained a large amount of cores were stored, making the researcher believe that the area he was excavating used to be a workshop for the production and manufacturing of canaanean blades. The discovery of Titris Hoyuk site complete with the entire range of manufacturing by-products, wealth of stored material, situated in an architectually typical domestic situation, provides a unique look into one form of specialized production in the early Bronze Age (Hartenberger, 2000). The analyses of the site showed that the canaanean blade production was specialized and restricted to the workshop since the residential housed in the area did not show the same objects and raw materials that were located at the workshop. From the study, the researcher was able to conclude that the production of the blades was independent from any type of elite control. The full sequence of production of the blades can be identified at the site, and adds much more information to our knowledge of how these essential tools were made and though the workshop had massive output, its organization seems to be domestic and independent (Hartenberger, 2000). Archaeologists can study Bronze and Iron Age tools in many different ways. The production of Bronze and Iron Age tools changed the development of material culture. From the tools, archaeologists can study the different metals present within the tools and also study their contexts. Analyses of the sites where the tools or weapons were excavated can show the archaeologist how much production and manufacturing was taking place along with whether or not the production was under elite control. Analyses of the tools and weapons can also provide insight into how these tools might have been used and who the tools and weapons were made for. Since bronze was less expensive than iron-casting it was likely that more people had access to bronze tools over cast iron tools. The invention of Bronze and Iron Age tool production changed the development of material culture. Pole, Len Michael. "The hammers of Mawu: ironworking traditions in the Togo Hills, Ghana. Recent Iron Age (between seventeenth and twentieth centuries), Ghana, West Africa. "African Archaeological Review 27, No. 1 (2010): 43-78. Anthropology Plus, EBSCOhost (accessed November 5, 2012). Read, Thomas T. 1934. "The early casting of iron. A stage in Iron Age Civilization." Geographical Review 544-554. Anthropology Plus, EBSCOhost (accessed November 5, 2012). El Morr, Ziad, and Michael Pernot. "Middle Bronze Age metallurgy in the levant: evidence from weapons of Byblos." Journal of Archaeological Science 38, No. 10 (2011): 2613-2624. Anthropology Plus, EBSCOhost (accessed November 5, 2012).